장단조 변화에 탁월합니다. 손에 닿는 느낌은 아주 부드럽습니다. 신제품 Peter Infeld 현은 힘과 우아함이 완벽하게 조화를 이룹니다. 당신의 연주를 매순간 즐겁고 황홀한 경험으로 만들어 줍니다. 이는 악기와 현의 완벽한 통합을 제공하는 고상한 Thomastik-Infeld Vienna 전통을 잇는 것입니다. The first ever platinum plated E string on the market (PI01PT) produces an aesthetic sound with substantial warm, powerful and clear content with a great capability of modulating the tone. The feeling under the fingers is remarkably soft. While using as low tension as possible the new Peter Infeld violin strings manage to produce a remarkably powerful sound. 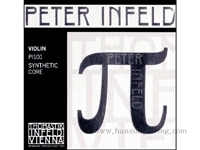 The concept of ?low tension?is consistent with a refined Thomastik-Infeld Vienna tradition which allows a perfect synthesis of the instrument and the strings.